Synthetic peptide (Human) - which represented a portion of human Minichromosome Maintenance Deficient 3 encoded in part by exons 10 and 11. Our Abpromise guarantee covers the use of ab3725 in the following tested applications. WB 1/2000 - 1/10000. Detects a band of approximately 110 kDa (predicted molecular weight: 90 kDa). Acts as component of the MCM2-7 complex (MCM complex) which is the putative replicative helicase essential for 'once per cell cycle' DNA replication initiation and elongation in eukaryotic cells. The active ATPase sites in the MCM2-7 ring are formed through the interaction surfaces of two neighboring subunits such that a critical structure of a conserved arginine finger motif is provided in trans relative to the ATP-binding site of the Walker A box of the adjacent subunit. The six ATPase active sites, however, are likely to contribute differentially to the complex helicase activity. Required for DNA replication and cell proliferation. 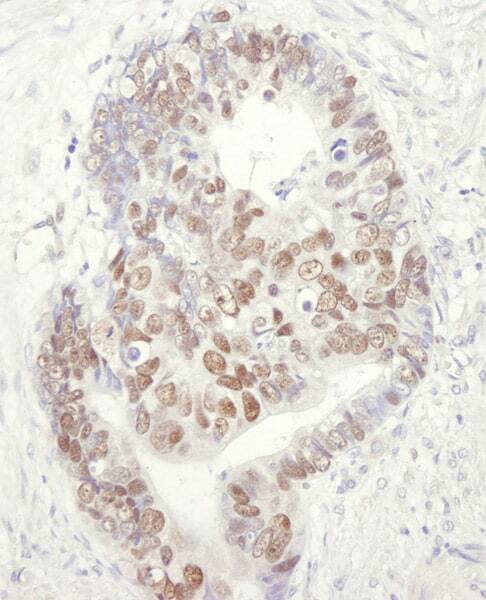 Immunohistochemistry (Formalin/PFA-fixed paraffin-embedded sections) analysis of human colon carcinoma tissue labelling MCM3 with ab3725 at 1/1000 (1µg/ml). Detection: DAB. Sample: Hela cell RIPA extract (60µg). Antibody: Affinity purified Goat anti-MCM 3 (ab3725) diluted 1 / 4000.
ab3725 has not yet been referenced specifically in any publications. Publishing research using ab3725? Please let us know so that we can cite the reference in this datasheet. Thank you for your enquiry. There is a very low probability that ab3724 would react with Drosophila MCM3 and very low to zero probability that ab3725 or ab4460 would react too. I hope this information will be useful. Should you require any other assistance, please do not hesitate to contact me. Unfortunately, we are not specialists in this area and we do not want to recommend a product that is unsuitable for your needs. We suggest that you refer to the latest literature in this field. Doing a quick search, a thought may be Ep-CAM (the following reference stated that "Normal endocervical glandular epithelium (Both columnar and reserve cells) appeared strongly positive for EP-CAM") - American Journal of Pathology, Vol 148, 865-875, Copyright © 1996 by American Society for Investigative Pathology.